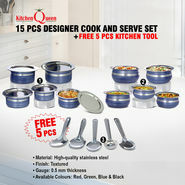 Add grace to your kitchen decor with 15 Pcs Designer Cook and Serve Set + Free 5 Pcs Kitchen Tool. 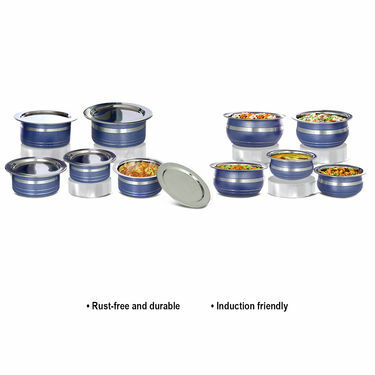 This induction friendly cookware is made from high quality stainless steel, this set is highly durable and rust-free. Bakelite handles are ergonomically designed for good grip and easy handling. 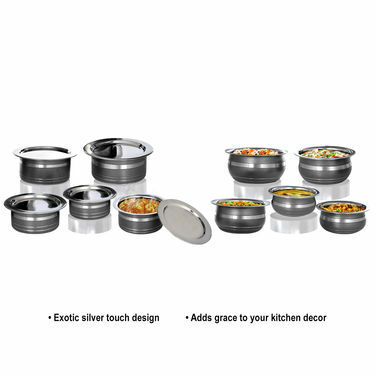 Easy to clean and wash, they have very exotic silver touch design. 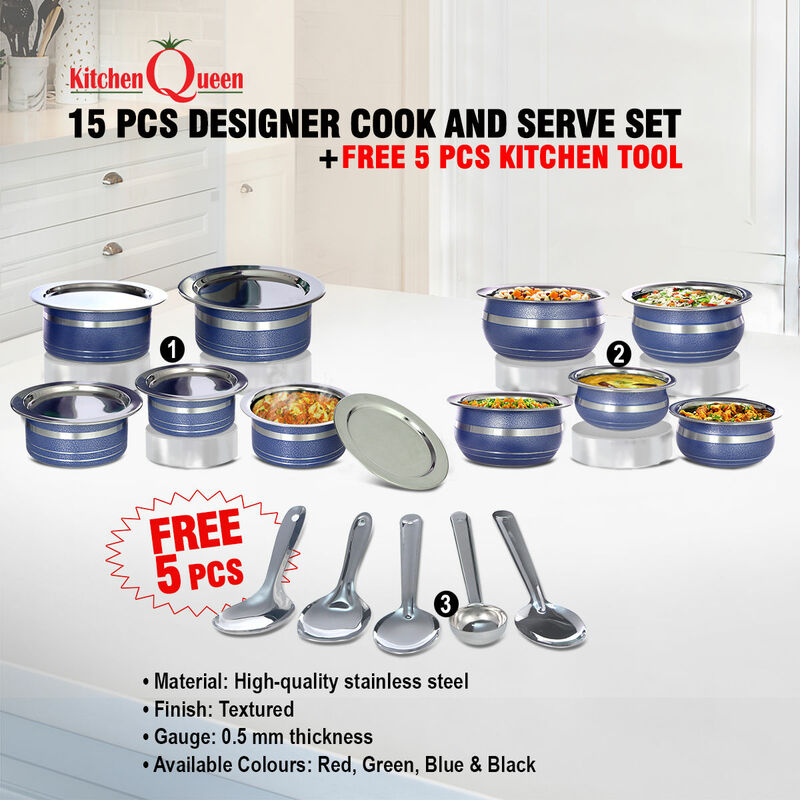 The 15 Pcs Designer Cook and Serve Set + Free 5 Pcs Kitchen Tool is an ideal combination of serving and cooking needs in your day-to-day life. When it comes to selecting a set of cookware you have many options to choose from in terms of materials but copper is one of the best materials to use. 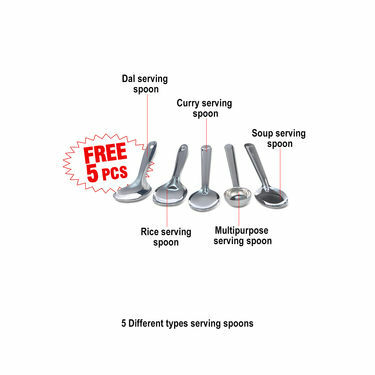 Keeping this in mind we reviewed 15 Pcs Designer Cook & Serve Set + Free 5 Pcs Kitchen Tool, indeed a right choice for you to consider that will not let you down and may even last for generations. Body Material: Made from high quality stainless steel, the set can resist extreme heat temperatures without leaving its natural shine even after daily use. 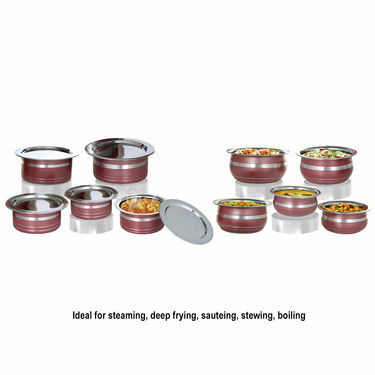 The sturdy steel prevents the products from dents and scratches during normal use. 15 Pcs Designer Cook and Serve Se..VS20 Pcs Copper Base Cook & Serve S.. 15 Pcs Designer Cook and Serve Se.. VS 20 Pcs Copper Base Cook & Serve S..
15 Pcs Designer Cook and Serve Se..VS15 Pcs Copper Base Cook & Serving.. 15 Pcs Designer Cook and Serve Se.. VS 15 Pcs Copper Base Cook & Serving..
15 Pcs Designer Cook and Serve Se..VS4 Pcs Marble Coated Cooking Set -.. 15 Pcs Designer Cook and Serve Se.. VS 4 Pcs Marble Coated Cooking Set -..
15 Pcs Designer Cook and Serve Se..VSMaster 5 Ltr Coloured Pressure Co.. 15 Pcs Designer Cook and Serve Se.. VS Master 5 Ltr Coloured Pressure Co..